When will I get my order? : Production time is 2 - 3 weeks. Add shipping time from Rhode Island. To view the UPS Ground Shipping Map, please Click Here. 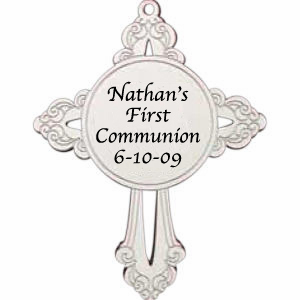 These First Communion ornaments will give your guests a lasting expression of your faith. The personalized religious ornaments can be used year after year as a reminder of both your event, and the importance of your religion in your lives. Personalize the ornament for any important holiday, and let your guests take home something special. Each stamped metal ornament is available silver plated or gold tone with your choice of cord colors. 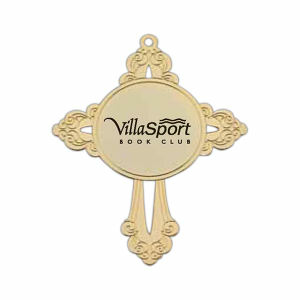 Our Cross ornament is priced to include a one color, one location imprint - you choose your font style and imprint color for the round medallion imprint area in the middle of the Cross. 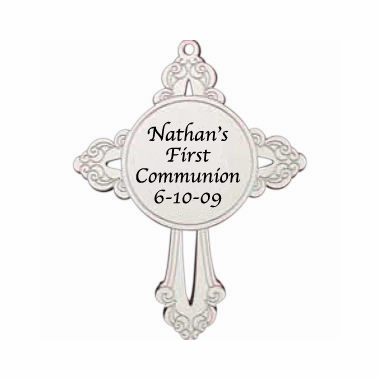 These personalized Communion Cross ornaments measure 2 3/16" x 3 3/4". Imprint area is 1" by 1". They are shipped in poly bags. Displaying your personalized text message is included in the ornament price. A custom design, graphic, or logo is an additional $15. Production time is 2 - 3 weeks. Add shipping time from Rhode Island. If there are any special artwork requirements, additional time may be needed. To view the UPS Ground Shipping Map, please Click Here. Please request a free sample ornament with another customer's imprint on it. Send us an email with the subject line: Communion Cross ornaments 127-CC to: orders@cool-party-favors.com please let us know if you would like a gold or silver sample. samples are sent via us mail.